The ensemble LES TIMBRES was revealed to the public when they were awarded a First Prize at the prestigious International Music Competition in Bruges (Belgium) in 2009. They decided to join the Flora cd label, and started this collaboration with Jean-Philippe Rameau's "pièces de Clavecin en Concerts" in 2014, which received a "Diapason d'Or". 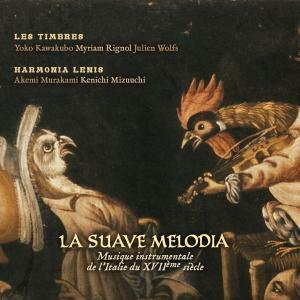 For the present recording, they invited the Japanese ensemble HARMONIA LENIS, with whom they have been working on a Franco-Japanese collaboration since 2010. This recording illustrates the evolution of the music in Northern Italy around 1600, when a new singing style for solo voice emerged in which words prevailed over sounds and ,at the same time, a period of profound change in the repertoire of instrumental music also began. During the 16th century, instruments were mainly limited to doubling or accompanying voices. The instrumental repertoire consisted mostly of arrangements of vocal works, or else of often rather simple dances. However, by the end of the century, instruments began to acquire an autonomous status. Indeed, several, sepcifically instrumental styles emerged, giving rise to new forms of music making.